Marlene first met me when I was about 15 years old and had been birding about a year. Nevertheless, when we were married 5 years later I'm sure she didn't realize what she was getting herself into. The two-week camping honeymoon, visiting many birding spots in Central Oregon and sleeping in the back of her dad's pickup should have been a significant clue. We grew up together after marriage and raised a family. Birding was always a major part of my life but Marlene never resented the time it took me away from her. Of course, I usually tried to include her. She did learn to identify the common birds, but didn't consider herself a birder. And she was always up for a camping trip and short walk watching birds, but not all day. I'd often rise at dawn to go birding--letting Marlene sleep in, then come back before noon and spend the rest of the day together. So now here we are, married 33 years, the kids all grown and on their own. The past year of unemployment has been challenging. Yet we are nearly inseparable, still very much in love. So, as Marlene was out this morning taking the dog to the vet, I was looking out the window at the bird feeders. No, not my bird feeders, her bird feeders. She set them up and keeps them filled. If not for this, I might not have seen 3 White-throated Sparrows total all year. But there are 3 different birds that visit our feeders daily. And a Slate-colored and Cassiar Junco. And a Pink-sided Junco yesterday--my first in western Oregon. And the interior form of Spotted Towhee, rather than the resident Oregon form. Without Marlene I likely wouldn't have a bird feeder. I'd be missing out on the daily visits of the female Townsend's Warbler to the suet, and Marlene's favorite, the Red-breasted Nuthatches, coming every few minutes to take another sunflower seed up into the tree and crack it open by pounding its bill into the seed as it holds it in its feet. 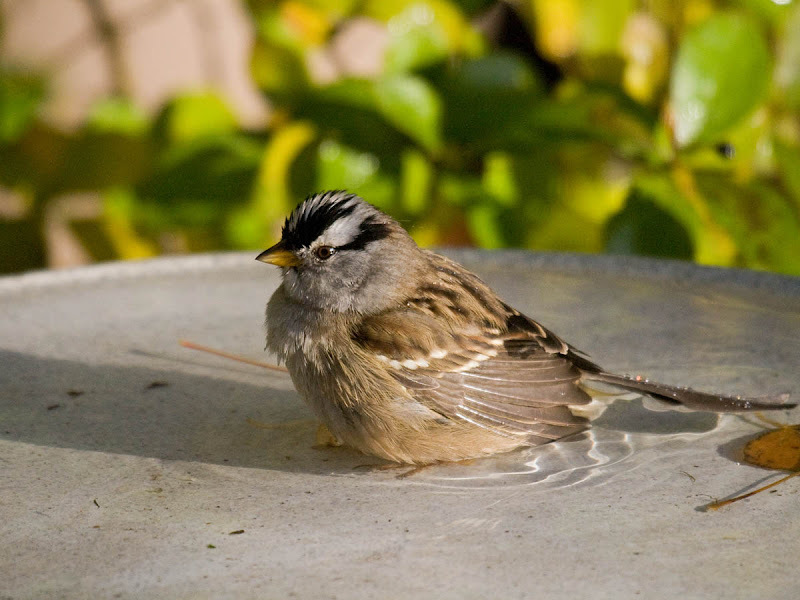 In a small token of my appreciation, I present some photos of a White-crowned Sparrow that Marlene took out our windows a few weeks ago. I helped her with camera settings and she had great fun. I can tell you that birding (and my life) wouldn't be nearly as much fun without Marlene. Greg, what a nice post. I can't help but think of my wife of 19 years, tolerant and supportive who makes everything more enjoyable. Lovely photos by Marlene. Nice post Greg. That gets us all in the right spirit for Valentine's Day. Greg, you and Marlene have a remarkable relationship, thanks for sharing this. Wonderful images Marlene. A lovely tribute to Marlene. It's obvious that she 'completes' you. Love her photographs! They are fun. When I hear the birds splashing about I always have to stop and watch. Awesome pictures. It was a joy to read about your life with Marlene. Cheers, Ruby! Thanks for the nice personal story and great photos. You are fortunate to have found each other. What a nice post, Your Marlene sounds very nice. A great tribute! My hubby does not mind my birding and most times is happy to go with me. Beautiful post and lovely tribute to your wife! Your post is a perfect Valentine for Marlene. How thoughtful of you to write it. What a nice homage to your wife! I have a husband who is not a birder but he enjoys photography and going to new places with me. and while I watch and count and photograph birds, he photographs whatever catches his fancy and we both enjoy the outdoors and seeing new places. It's a win-win all the way around, though it did help the situation a lot once we both had our own cameras! 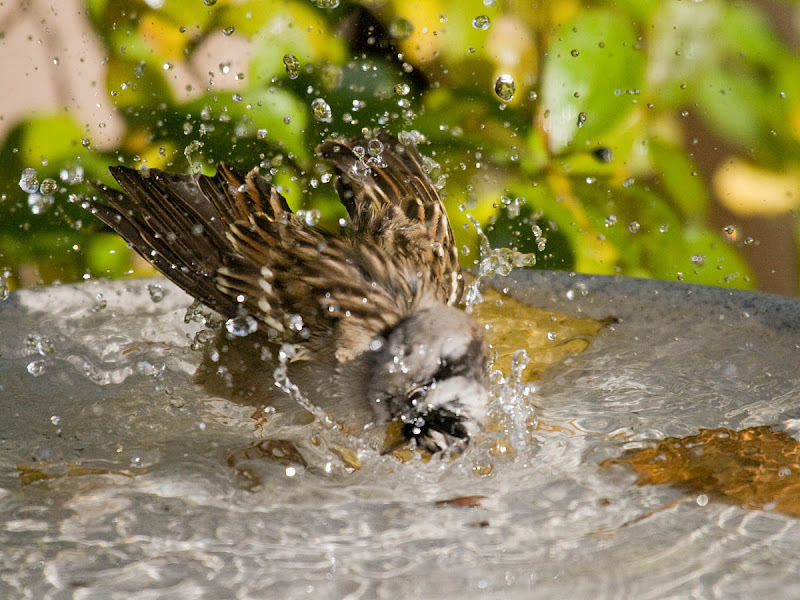 By the way, Marlene did a great job photographing those sparrows! May your love for each other continue to grow! Greg, such a lovely tribute to your wife, Marlene. It sounds like you two have a beautiful relationship. 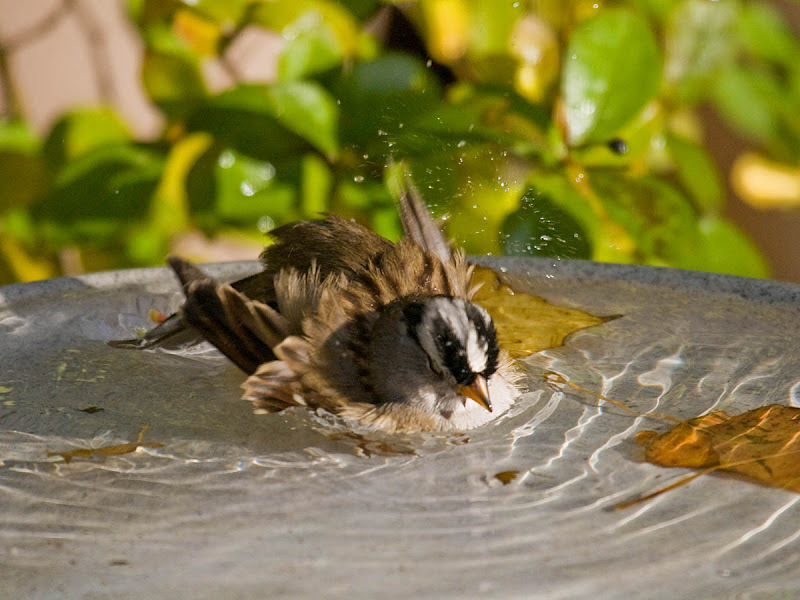 Marlene took some fantastic photographs of the White-crowned Sparrow splishin' and splashin'. I so enjoyed reading this wonderful heartfelt post!